Smart and effective, 4Media FLV to AVI DivX Converter is a great way to convert Flash Video FLV to AVI/DivX/XviD video file, or MP3/WAV audio file. All the videos collected from YouTube or other video services are supported in this FLV to AVI, FLV to DivX converter. No need to bother with FLV playing problem now! 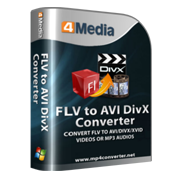 4Media FLV to AVI DivX Converter brings you the best way to turn Flash Video FLV into AVI/DivX/XviD formats and play them on Windows Media Player and other popular media players. You can also extract audio from Flash Video file and save as MP3/WAV file for playing on all kinds of MP3 players. The FLV to AVI, FLV to DivX converter offers user-friendly interface and allows one-click conversion. Besides, a lot of flexible features are provided for more advanced users, such as setting bit rate, frame rate, resolution, duration and other parameters, managing power, customizing file size, previewing and taking snapshot. The profile settings are classified by different types. Download the free trial and enjoy Flash Video files anytime anywhere with 4Media FLV to AVI DivX Converter! 4Media FLV to AVI DivX Converter delivers the easiest solution to convert Flash Video file to AVI/DivX/XviD for playback on Windows Media Player, Windows Mobile devices and so on. As an audio extractor, this program can also get MP3/WAV audio file from FLV by extracting and converting. Enjoy the music from the Internet freely without any limitation. 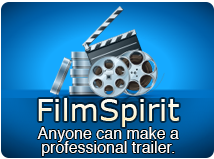 Support one-click conversion to convert multiple Flash Video files into AVI, DivX and XviD videos by one click. 4Media FLV to AVI DivX Converter supports one task distributed on multi-core CPU to reach the super fast FLV conversion speed. Batch conversion and multithreading lets you enjoy easier and quicker FLV to AVI conversion experience. With this FLV to AVI converter, you can convert Flash video file to AVI, DivX, XivD video or MP3, WAV audio without installing any other plug-ins and programs. To get the output file size your want, just enter the exact value in the Bitrate Calculator. This FLV to AVI converter, FLV to DivX converter allows you to set multiple profiles with different parameters for one FLV source file and convert them in one click. With the built-in video player, you can preview the source file before conversion and capture the desired frame as a BMP picture at any time during playback. The player can switch to be stand-alone with adjustable aspect ratio (4:3 and 16:9). Choose one after done action from exit, shut down, hibernate and standby, and the program will automatically perform the action you specify after finishing the FLV to AVI, FLV to DivX conversion. Multiple languages: English, Japanese, German, French and Chinese are provided. How to convert FLV files to AVI, how to convert FLV to DivX?